ubuntu cloud images – More Mind Spew-age from Harold Spencer Jr. Recently, Amazon Web Services (AWS) announced that their CodeDeploy service supports on-premise instances. This is extremely valuable – especially for developers and administrators to allow utilization of existing on-premise resources. For teams who are using HP Helion Eucalyptus 4.1 (or who want to use Eucalyptus), this is even better news. This feature – along with HP Helion Eucalyptus 4.1 Cloudformation – developers can deploy applications within a private cloud environment of HP Helion Eucalyptus. This makes it even easier for developers and administrators to separate out and maintain production (AWS) versus development (HP Helion Eucalyptus) environments (or vice versa). In addition, since HP Helion Eucalyptus strives for AWS compatibility, the Cloudformation templates used on Eucalyptus, can be used with AWS – with just a couple of modifications. To leverage on-premise instances with AWS CodeDeploy, please reference the AWS documentation entitled “Configure Existing On-Premises Instances by Using AWS CodeDeploy“. To use these steps with an HP Helion Eucalyptus cloud, a slight change had to be done to the AWS CLI tools. When using the ‘aws deploy register’ command, AWS CLI checks to see if the instance is running on an AWS environment by confirm if the instance metadata is present. For on-premise cloud environments that provide the same service, this will cause the on-premise instance registration to fail. To resolve this issue, I updated the AWS CLI tools with a patch that checks the instance metadata variable ‘AMI ID’ – which on AWS will begin with ‘ami’. All images on Eucalyptus start with ’emi’ (i.e. Eucalyptus Machine Images). With this patch, on-premise instance registration completes without a problem. Once these requirements have been met on the HP Helion Eucalyptus 4.1 environment, developers can use their AWS credentials in the Eucalyptus Cloudformation templates to leverage the on-premise instances with AWS CodeDeploy. Once there are values for these parameters, the Cloudformation templates can be utilized to deploy the on-premise instances. As we can see above, the Eucalyptus Cloudformation instances are tagged just as if they were running on AWS – again demonstrating the AWS compatibility desired by HP Helion Eucalyptus. 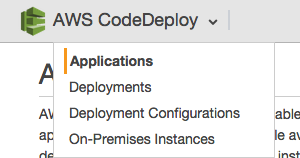 Now developers can proceed with remaining steps of using AWS CodeDeploy to do an application deployment. As demonstrated, the new feature in AWS CodeDeploy allows developers to gain a true sense of a hybrid cloud environment. This feature – along with HP Helion Eucalyptus’s AWS compatibility – makes it easy for developers and administrators to use the same toolset to deploy, manage and maintain both public and private cloud environments. Don’t forget – using AWS CodeDeploy with on-premise instances does have an AWS pricing cost associated with it. Check out AWS CodeDeploy Pricing for more details. I frequently check out Dustin Kirkland’s blog to get ideas about how to secure instances running on various cloud infrastructures. Recently, I stumbled across one of his blog entries, where he discussed a package called ‘overlayroot‘, which is part of the cloud-initramfs-tools package for Ubuntu. The really interesting feature I liked about this package is the ability to encrypt – using dmcrypt – the root filesystem of the instance. What this means that if the Node Controller (NC) that hosts the instance happens to become compromised, the information on the device associated with the instance can’t be accessed. In addition, overlayroot allows the root filesystem of the instance to be ‘laid’ on top of another device that is bigger in size. The advantage here is that there isn’t a need to re-create an image with a larger root filesystem. Overlayroot is available with any Ubuntu Cloud image from 12.10 (Quantal Quetzal) to the most recent at the time of this blog, 14.10 (Utopic Unicorn). For this blog, Ubuntu 14.04 LTS (Trusty Tahr) will be used. As mentioned in the overlayroot blog entry, the configuration of overlayroot is located in /etc/overlayroot.conf. This can be configured before this Ubuntu Cloud image is bundled, uploaded and registered as an EMI, or after. For brevity, overlayroot will be configured after the Ubuntu Cloud image has been bundled, uploaded and registered. After unmounting the image, just bundle, upload and register the image as an instance store-backed HVM EMI. When an instance is launched from the EMI, the root filesystem will automatically be encrypted. Using overlayroot gives additional instance security for the cloud user. For more information about the additional configuration options of overlayroot, please refer to the overlayroot.conf file in the cloud-initramfs-tools repository on Launchpad. This blog entry is a follow-up of my blog entry entitled “Step-by-Step Deployment of Docker on Eucalyptus 3.4 for the Cloud Administrator“. In that blog entry, I covered how to deploy an Ubuntu Raring Cloud Image on Eucalyptus, and use that image to deploy Docker. The really cool thing about Docker is that it provides the ability to deploy different operating systems within one machine – in this case, an instance. The focus of this entry is to show how to deploy a CentOS 6.5 image in a instance running Docker on Eucalyptus 3.4. AuthorizeSecurityGroupIngress – to authorize SSH traffic in the security group the instance is using. Check out euca-authorize for more information. CreateKeyPair – to create a keypair to access the instance through SSH. Check out euca-create-keypair for more information. CreateSecurityGroup – (optional) if a security group is not specified when using euca-run-instances, the ‘default’ security group is used. For more information, check out euca-create-group. DescribeImages – to describe the Ubuntu Raring EMI provided by the cloud administrator. Check out euca-describe-images for additional information. DescribeInstances – to check the status of the recently launched instance. Refer to euca-describe-instances for additional information. RunInstances – to launch the instance. Check out euca-run-instances for additional information. If the –region option seems confusing, this is due to the fact that I am using the nice configuration file feature in Euca2ools. Its really helpful when you are using different credentials for different users. Your Ubuntu release is not supported anymore. Now its time to prepare the instance to create your own base Docker CentOS 6.5 image. Now we are ready to build the CentOS 6.5 Base Image. As you can see, Docker helps developers test their software across multiple Linux distributions. With Eucalyptus (just as in AWS), users can use the ephemeral nature of instances to quickly stand up this test environment in one instance. In previous posts, I shared how to use Ubuntu Cloud Images and eustore with Eucalyptus and AWS. This blog entry will focus on how to use these assets to create EBS-backed EMIs in 12 steps. These steps can be used on AWS as well, but instead of creating an instance store-backed AMI first, Ubuntu has already provided AMIs that can be used as the building block instance on AWS. Let’s get started. This entry also assumes Eucalyptus euca2ools are installed on the client machine. Although the Ubuntu Cloud Image used in this entry is Ubuntu Precise (12.04) LTS, any of of the maintained Ubuntu Cloud images can be used. -s "Ubuntu Cloud Image - Precise Pangolin - 12.04 LTS"
Thats it! You have successfully created an EBS-backed EMI/AMI. As mentioned earlier, these steps can be used on AWS just as well (just skip steps 1 & 2, and use one of the Ubuntu Cloud Images in the AWS region of your choice). Enjoy! Ubuntu provides versatile cloud images that can be utilized on various cloud deployment infrastructures. Eucalyptus’s euca2ools eustore tool makes it easier for cloud administrator’s to bundle, upload and register images on Eucalyptus clouds. Using eustore-install-image with Ubuntu Cloud images provides the best of both worlds – solid cloud images that can be easily deployed to any Eucalyptus cloud environment. Since kernel, ramdisk and root filesystem images will be bundled, uploaded and registered, the cloud administrator’s credentials were used in the euca2ools configuration file. For more information about kernel and ramdisk management in Eucalyptus, check out the KB article entitled “Kernel and Ramdisk Management in Eucalyptus”. To obtain Ubuntu Cloud images that will be bundled, uploaded and registered with eustore-install-image, download the supported Ubuntu Cloud image release of your choice from the Ubuntu Cloud Images page. Download the file thats ends with either amd64.tar.gz or i386.tar.gz using either curl, wget or any other network transfer tool. This will download and save the saucy-server-cloudimg-amd64.tar.gz file. Now its time to use eustore-install-image to bundle, upload and register the image. Now that the kernel, ramdisk and root filesystem are bundled, uploaded and registered, the launch permission of each image needs to be changed so that all the users of the Eucalyptus cloud can launch instances from these images.